To make this Minnie Mouse cake, I used a Wilton Mickey Mouse cake pan and just added the touches of Minnie Mouse with star tips and writing tips. I used smooth icing for the face though. Very cute!!!! You did a good job!!!! Join in and write your own page! It's easy to do. How? 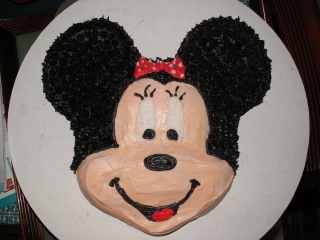 Simply click here to return to Minnie Mouse Cake.